This kit is meant to be used in conjunction with the FREE sewing pattern and tutorial for Cat on my website, www.fluffmonger.com. 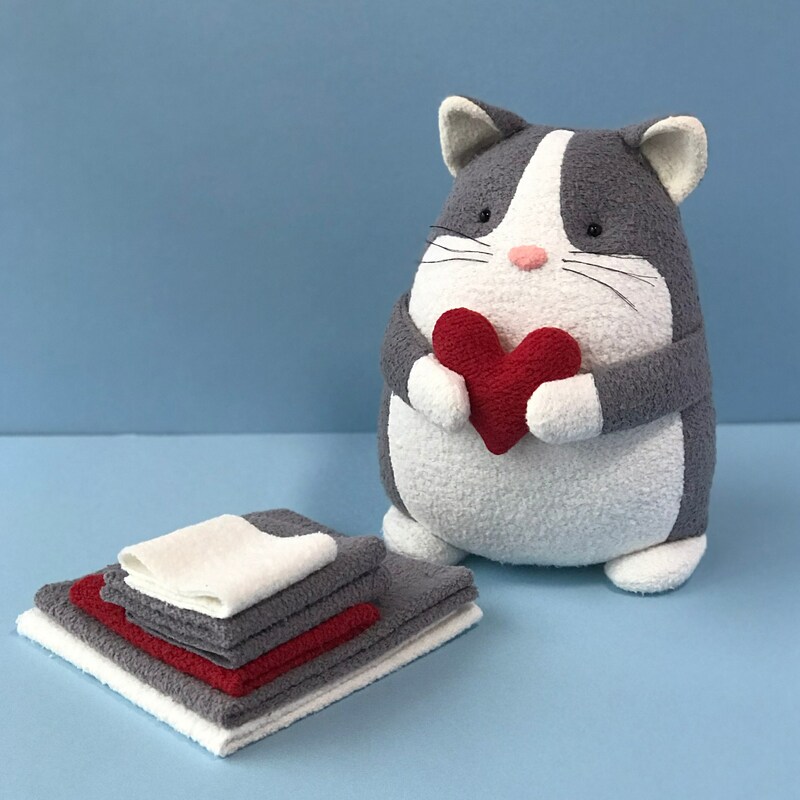 This kit provides just the right amount of hand-dyed organic cotton and hemp fleece for sewing one cat. Choose from a kit with just fabric or a deluxe kit with thread and and tools. *Fabric will come cut down to the size needed for tracing pattern pieces. It will not come as yardage. Cuts may vary slightly from layout shown in image. Coordinating thread colors may not be exact match due to color variations from hand-dyeing. Items you will need that are not available in my shop: stuffing, embroidery floss, 90/14 ball point needle. Fabric is washed once before dyeing and twice after with organic, unscented soap, then it is dried, ironed and combed before cutting. Due to monitor display differences, actual colors may vary slightly from photos. If you need me to email you the PDF directly after purchasing a kit, just send me a message. Shipping amounts are estimates. If you feel the estimated shipping amount is incorrect, feel free to send me a message so I can give you a more accurate estimate for your location. 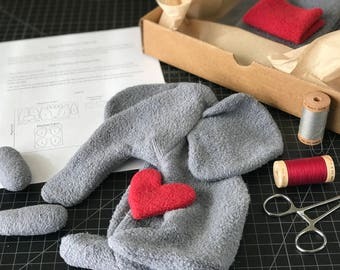 Fluffmonger patterns may be used to create handmade toys to sell, but items may not be mass-produced. Please give credit to Fluffmonger with “pattern by Fluffmonger” and a link to my website, www.fluffmonger.com on your tags and listings. If you modify the pattern or use certain pieces to create another pattern, still credit Fluffmonger, as these are considered derivative works. I love these kits so much! Lovely fabric for amazing toys. This chubby bunny was so much fun to make. The pattern was well written and easy to follow along. Lots of pictures and tips!! Had a blast making it. Thanks! North Carolina residents must be charged 6.75% sales tax. Please read “Item Descriptions” and “Store Policies” carefully and contact me with any questions before purchasing. If you have any concerns or problems with your purchase upon receipt, please contact me. Due to the nature of digital files, once downloaded, all sales are final and non-refundable. I do not accept returns. I offer exchanges only in the event that there was an error on my behalf. In order for an exchange to be offered, items must be returned in their original condition and have not been exposed to smoke or fragrances. Listed prices are estimates. If you feel that the estimated shipping price is incorrect, or it you would like a more accurate shipping quote for your location, please message me before purchasing. If your purchase includes a "made-to-order" or "pre-order" item, please read the item description for an estimation of when your purchase will be ready to ship. For international shipping, customers are responsible for any customs fees, taxes or duties levied by their country. Patterns and tutorials will be delivered as a digital file via email. They are digital files only, so no physical product will be shipped. Fluffmonger plush are soft sculptures and should be treated with care and loved gently. Certain items in my shop are designed as collectibles and may not be suitable for small children. If you have questions about which of my items are intended for babies, children, or as collectibles, please feel free to message me. In the event that a spill occurs, spot-clean only. You may not reproduce, share, freely distribute, or sell this pattern, or parts of it, in digital form, printed form, or any other form. My patterns may not be used for mass production. 2. Items may not be mass-produced. They must be made one at a time by hand. 3. Items may ONLY be made by the individual who purchased the pattern. 4. Credit for the pattern is given to Fluffmonger on a tag affixed to each item with "Made from an original Fluffmonger® Pattern from www.fluffmonger.com” (no variations in wording). If selling online, the listing (on Etsy, etc.) must also contain a direct link to where the pattern can be purchased. 5. You may make alterations to the pattern, but you must still provide a link to the original pattern and credit Fluffmonger on the item’s tags and listings. All images, logos, designs, and photos are property of Fluffmonger.